[In 2 Nephi 25:19] Nephi specifically refers to the fact that the angel of God revealed the name of the Messiah and that his name would be “Jesus Christ the Son of God”. And Jesus Christ is precisely what the angel in 1 Nephi 12:18 gives as the name of the Lamb of God. It is uncertain why Joseph Smith amended 1 Nephi 12:18 to say “the Messiah” instead of Jesus Christ. Clearly, it makes no substantive difference in the meaning of the passage—both Messiah and Jesus Christ refer to the same person, who is the Savior and Redeemer of the world. So neither reading is a mistake or incorrect. Yet this change illustrates that even when variant readings make no difference in meaning, they can answer some questions, and being aware of them can be helpful. There are over 100 name-titles used for Christ in the Book of Mormon. With such a variety of epithets for the Savior at their disposal, different Nephite writers showed preferences for different name-titles. Understanding what these preferences were, as well as the meaning of each of Christ’s names, often sheds light on the specific ways individual authors related to and understood the Savior. This requires knowing what name-titles the original authors used, as can best be determined through the English translation. Whatever the name was which originally got translated as Jesus Christ in 1 Nephi 12:18—possibly the Hebrew Yeshua haMashiah—the angel’s use of it had an impact on Nephi. He remembered and wrote it down, but then chose not to use it again until he was nearly finished with his record, after quoting extensively from Isaiah. 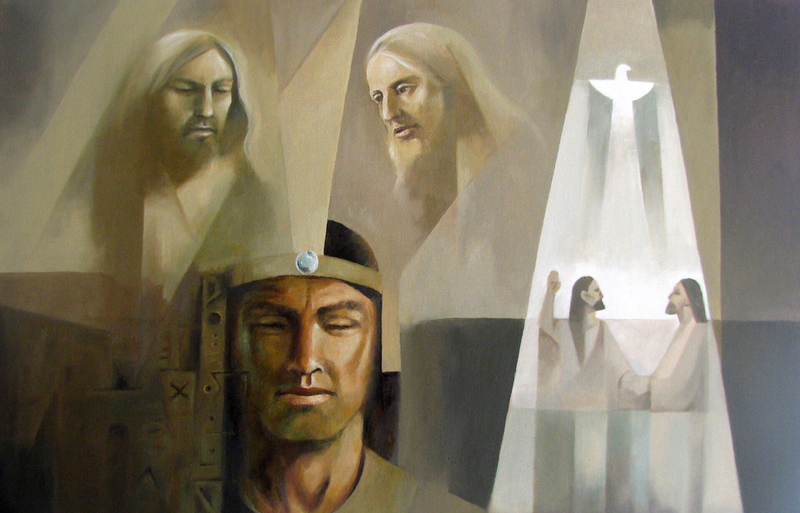 Then, after reintroducing the name and reminding readers that an angel had revealed it, Nephi went on to use both Jesus and Christ together 5 more times, and the name Jesus alone appears another 3 times. Perhaps Nephi chose to begin using the name during his commentary on Isaiah because, in Hebrew, “The names ‘Jesus’ and ‘Isaiah’ are similar in form and meaning.” Both names are based on the root word yasha, meaning salvation. It thus may not be a coincidence that right after Nephi reminded readers of the angelically revealed name Jesus Christ, Nephi taught the most central doctrine of the Gospel: “there is none other name given under heaven save it be this Jesus Christ, of which I have spoken, whereby man can be saved” (2 Nephi 25:30). By the time he was finishing his record, the name Jesus apparently came to have particular significance for Nephi—perhaps because of the way his family had been saved from destruction and exile. In his closing testimony, Nephi wrote, “I glory in my Jesus, for he hath redeemed my soul from hell” (2 Nephi 33:6). Wording and punctuation varies slightly from the standard LDS edition of the Book of Mormon, and instead follows Royal Skousen, ed., The Book of Mormon: The Earliest Text (New Haven, CT: Yale University Press, 2009), 132. For the reasons for this change, see Royal Skousen, Analysis of Textual Variants of the Book of Mormon: Part Two, 2 Nephi 11–Mosiah 16, The Book of Mormon Critical Text Project, Volume 4 (Provo, UT: FARMS, 2005), 820–821. See, for example, Monte S. Nyman, Book of Mormon Commentary, 6 vols. (Orem, UT: Granite Publishing, 2003), 1:600–601. Edward J. Brandt, “The Name Jesus Christ Revealed to the Nephites,” in Second Nephi, the Doctrinal Structure, ed. Monte S. Nyman and Charles D. Tate Jr., The Book of Mormon Symposium Series, Volume 3 (Provo, UT: Religious Studies Center, Brigham Young University, 1989), 202–203 treated 2 Nephi 10:3 and 2 Nephi 25:19 as separate revelations, and regarded 2 Nephi 10:3 as the first occurrence of Christ and 2 Nephi 25:19 as the first occurrence of Jesus. In his class lectures, Hugh Nibley asserted that 2 Nephi 25:19 is the first occurrence of Christ. Hugh Nibley, Teachings of the Book of Mormon, 4 vols. (American Fork and Provo, UT: Covenant Communications and FARMS, 2004), 1:261. Royal Skousen, Analysis of Textual Variants of the Book of Mormon: Part One, 1 Nephi 1–2 Nephi 10, The Book of Mormon Critical Text Project, Volume 4 (Provo, UT: FARMS, 2004), 259. Skousen, Analysis of Textual Variants, Part 1, 259. On this revelation, see Book of Mormon Central, “Why Does an Angel Reveal the Name of Christ to Jacob? (2 Nephi 10:3),” KnoWhy 36 (February 18, 2016). For background on this project, see Royal Skousen, “Towards a Critical Edition of the Book of Mormon,” BYU Studies 30, no. 1 (1990): 41–69; Royal Skousen, “History of the Critical Text Project of the Book of Mormon,” in Uncovering the Original Manuscript of the Book of Mormon: History and Findings of the Critical Text Project, ed. M. Gerald Bradford and Alison V. P. Coutts (Provo, UT: FARMS, 2002), 5–21; Royal Skousen, “A Brief History of the Critical Text Work on the Book of Mormon,” Interpreter: A Journal of Mormon Scripture 8 (2014): 233–248; Royal Skousen, “Restoring the Original Text of the Book of Mormon,” Interpreter: A Journal of Mormon Scripture 14 (2015): 107–117. Skousen, ed., The Earliest Text, 32. Sword (in place of word) is also a restoration of an original reading, found only in the original manuscript. See Skousen, Analysis of Textual Variants, Part 1, 257–258. See also, Royal Skousen, “Some Textual Changes for a Scholarly Study of the Book of Mormon,” BYU Studies Quarterly 51, no. 4 (2012): 102–103; Royal Skousen, “The Original Text of the Book of Mormon and Its Publication by Yale University Press,” Interpreter: A Journal of Mormon Scripture 7 (2013): 80–81; Skousen, “History of the Critical Text Project,” 15; Royal Skousen, “The Systematic Text of the Book of Mormon,” in Uncovering the Original Manuscript, 49. This is most clearly noted in Skousen, ed., The Earliest Text, 748. See also Skousen, Analysis of Textual Variants, Part 1, 258. The reading of the original manuscript can be verified in Royal Skousen, ed., The Original Manuscript of the Book of Mormon: Typographical Facsimile of the Extent Text, The Book of Mormon Critical Text Project, Volume 1 (Provo, UT: FARMS, 2001), 111. For the printer’s manuscript, see Royal Skousen, ed., The Printer’s Manuscript of the Book of Mormon: Typographical Facsimile of the Entire Text in Two Parts—Part One, 1 Nephi 1–Alma 17, The Book of Mormon Critical Text Project, Volume 2 (Provo, UT: FARMS, 2001), 88; Royal Skousen and Robin Scott Jensen, eds., Revelations and Translations Volume 3, Part 1: Printer’s Manuscript of the Book of Mormon, 1 Nephi 1–Alma 35, The Joseph Smith Papers (Salt Lake City, UT: Church Historian’s Press, 2015), 57. While preparing the 1837 edition, Joseph Smith actually edited the printer’s manuscript to say Mosiah, which then got typeset as Messiah. See Skousen, Analysis of Textual Variants, Part 1, 259. Skousen, Analysis of Textual Variants, Part 1, 258. Skousen, Analysis of Textual Variants, Part 1, 258–259. Skousen, Analysis of Textual Variants, Part 1, 259. This connection between the original reading of 1 Nephi 12:18 and 2 Nephi 25:19 was actually noted in 1993 in Brent Lee Metcalfe, “The Priority of Mosiah: A Prelude to Book of Mormon Exegesis,” in New Approaches to the Book of Mormon: Explorations in Critical Methodology, ed. Brent Lee Metcalfe (Salt Lake City, UT: Signature Books, 1993), 429–432. However, Metcalfe, a skeptic of Book of Mormon historicity, made the somewhat odd argument that the angelic revelation of the name Jesus Christ in 1 Nephi 12:18 somehow “exposes difficulties” for explanations that the term Christ “should not be viewed as anachronistic because it is prophetic” (p. 429). For responses to Metcalfe’s arguments regarding the use of Christ and Jesus Christ in the Book of Mormon, see John A. Tvedtnes, review of New Approaches to the Book of Mormon: Explorations in Critical Methodology, edited by Brent Lee Metcalfe, Review of Books on the Book of Mormon 6, no. 1 (1994): 49–50; Matthew Roper, “A More Perfect Priority?” Review of Books on the Book of Mormon 6, no. 1 (1994): 366–367. While in Analysis of Textual Variants (p. 259), Skousen speculated as to why this change was made, he later explained that “we can’t be absolutely sure what was in Joseph Smith’s mind” as he made this and other changes. Royal Skousen, “Changes in the Book of Mormon,” Interpreter: A Journal of Mormon Scripture 11 (2014): 169. On the number of names of Christ in the Book of Mormon, see Susan Easton Black, Finding Christ Through the Book of Mormon (Salt Lake City, UT: Deseret Book, 1987), 16–18; Jeffrey R. Holland, Christ and the New Covenant (Salt Lake City, UT: Deseret Book, 1997), 353–355; Susan Easton Black, “Jesus Christ, names of,” in Book of Mormon Reference Companion, ed. Dennis L. Largey (Salt Lake City, UT: Deseret Book, 2003), 457–458. John W. Welch and J. Gregory Welch, Charting the Book of Mormon: Visual Aids for Personal Study and Teaching (Provo, UT: FARMS, 1999), charts 44–47. See John W. Welch, “Ten Testimonies of Jesus Christ from the Book of Mormon,” in Doctrines of the Book of Mormon, ed. Bruce A. Van Orden and Brent L. Top (Salt Lake City, UT: Deseret Book, 1992), 223–242. On the Hebrew for Jesus Christ, see D. Kelly Ogden and Andrew C. Skinner, Verse-by-Verse: The Book of Mormon, 2 vols. (Salt Lake City, UT: Deseret Book, 2011), 1:227. For Jesus Christ, see 2 Nephi 25:20; 26:12 (2x); 30:5 (2x). For only Jesus, see 2 Nephi 31:10; 33:4, 6. Margaret Barker, “Isaiah,” in Eerdmans Commentary on the Bible (Grand Rapids, MI: Wm. B. Eerdmans, 2003), 490. Yesha‘yahu (Isaiah) is composed of yesha, which means “help, deliverance, salvation,” and then the theophoric yahu, meaning Yahweh. Yeshua (Jesus) is another form of the name Yehoshua (Joshua) and likewise derives from yasha. See Ludwig Koehler and Walter Baumgartner, The Hebrew and Aramaic Lexicon of the Old Testament, trans. M.E.J. Richardson, 2 vols. (Leiden: Brill, 2001), 1:446, 449. See also “Isaiah,” “Jesus,” and “Joshua,” in Book of Mormon Onomasticon, ed. Paul Y. Hoskisson, online at onoma.lib.byu.edu. In “Jesus,” in Book of Mormon Onomasticon, it was proposed this was a Hebrew parallelism with “a double entendre or intended a play on words” using redeemed and Jesus (the Lord is salvation) as parallel terms.